The IYT International Flotilla-Bareboat Skipper Preparation Course is now available via eLearning absolutely free of charge! 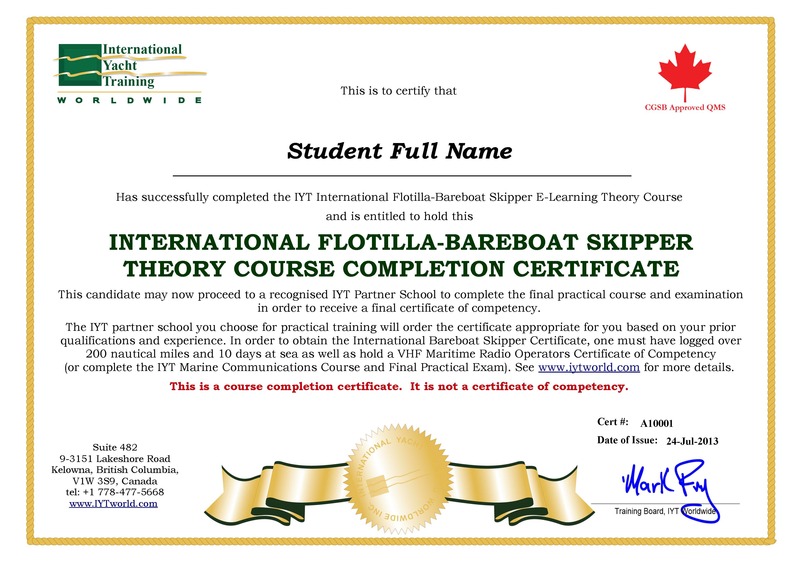 At the end of the course and theory examination, students will gain access to their final “IYT International Flotilla-Bareboat Skipper Theory Course Completion Certificate” which they may provide to schools to take the final practical training & assessment. Students who complete the online theory course will be better prepared to enjoy their practical training. To take the free course, please go to www.iytworld.com and login or register and purchase the free course. Then see “My eLearning Courses” under the Dashboard menu item to access the course.